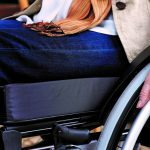 Manual Wheelchairs, both rigid and folding, vary in design, construction and how they function. It is a very individualized choice for each wheelchair user. 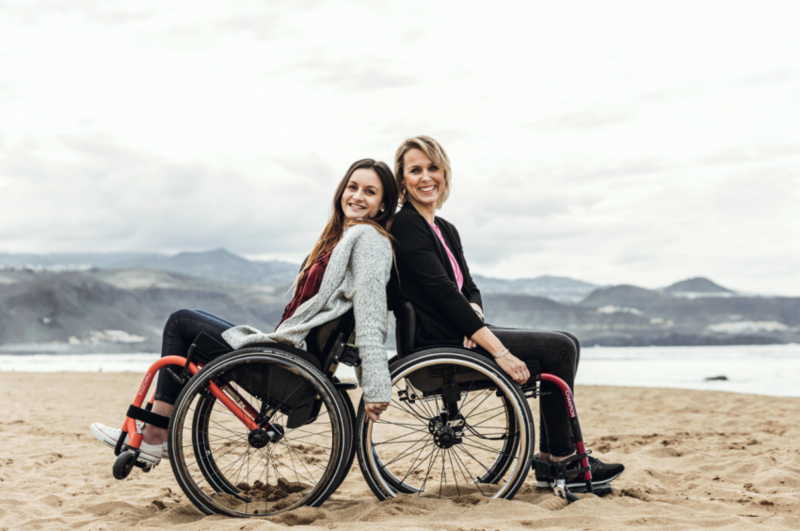 What adjustments are available to ensure it’s a good fit for posture and comfort, and efficient propulsion for maneuverability and performing daily activity. Strength, weight and durability of the chair varies depending on what materials are used. Durability is achieved when the material used in the design of the frame has a higher strength to weight ratio. Here is a summary of the differences, advantages and disadvantages to consider. But with that said, there is nothing more important than trialing the chair you are considering for the fit, propulsion efficiency and how it transports to ensure it meets ALL your needs. Titanium is considered to have a higher strength to weight ratio than aluminium and therefore less material is needed to build the frame. This means that a lighter frame can be achieved. In addition, Titanium has a high fatigue life, meaning the frame is not easily bent or damaged. It is corrosion resistant unlike Aluminium which has an additional coating added to prevent this. 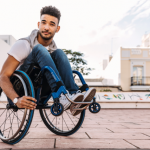 Titanium has been reported to have “dampening effects” on the body by reducing vibration when propelling, while the studies are inconclusive, some wheelchair users feel the difference in “flex” of the titanium that provides a different ride. Aluminium is a metal that is easier to work with and more economical. In recent years “7000 series Aluminium” versus earlier versions heat treated and is stronger and therefore less material is needed and therefore the weight is also reduced. The disadvantages however, are higher chances of structural damage if the frame is exposed to strains. This is dependent on the frame design as some are “box” frame with added support tubes, others are open “cantilever” style. There will be further detail on this later in the blog. The use of Carbon Fibre has been introduced to the manual wheelchair market. It is a lightweight, stiff material, that is corrosion resistant, however it is expensive and a difficult material to shape. 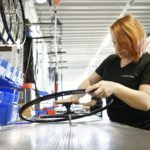 Carbon Fibre can have poor impact resistance, meaning a higher risk of damage, and therefore you may see more components offered in this material with the intention to reduce the overall weight of the wheelchair. Again, design plays a part in this as well. Depending on the style and components of the wheelchair frame, the weight difference of the base alone can be less than one pound, or just less than a half a kilogram, and therefore if titanium is not affordable, the chair will still be lightweight. .
“Total weight” of the wheelchair. Lifting weight. The total weight involves the frame weight and the weight of the components and seat cushion and back support. When the overall weight is reduced it improves optimal propulsion efficiency and energy conservation. It is important to remember that you can start with an ultralightweight frame but end up with a heavier final wheelchair system if your not careful about the weight of the components and seating you choose. Alternatively it’s possible to have a heavier chair that is configured where the wheel access is optimal for propulsion (set further forward) making it more efficient than a poorly configured lighter frame chair. Be careful when comparing the “quoted” weights especially when comparing between manufacturers. The base weights are weighed differently with regards to which components are included or not. Folding Manual Wheelchair have traditionally been a “cross-brace “, “X” design where the frame folds in half by bringing the sides of the wheelchair together. More recently, a “scissor” brace frame has been designed e.g “Küschall Champion”, that allows the user to fold and unfold the chair from the front and back of the chair. The “cross-brace” design folding frames by virtue of their design have more “moving parts” to allow the chairs to fold. This can add weight although this is significantly improved. Folding frames are available in Titanium and Aluminium and Carbon Fibre. They were traditionally designed to whereby only the footplates flipped up out of the way for stand transfers. Then they progressed to swing-away legrests, and removable arms. This progressively made the chair lighter for taking off components to make it smaller and lighter for transport. Quick release axles are an option offered on many chairs and help reduce the transfer weight and size for smaller vehicles. A newer style, the scissor brace folds by pulling the release mechanism from the front of the chair, making it accessible for the end- user to reach and fold themselves. Folding chairs have their advantage with swing-in or out mechanism and the primary consideration for use is an open area on front of the chair for transfers. 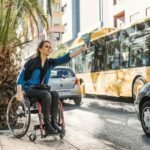 Rigid Manual Wheelchairs for everyday mobility were developed with design concepts from sports wheelchairs. Traditionally Aluminium was used for sport but the frames are also available in Titanium and Carbon Fibre for everyday use. Aluminium in sport is preferred as you do not loose energy as you push. Also the reduced number of moving parts created a wheelchair base that was lighter. This means that each push on the wheel would take the individual farther with less effort thus giving them a competitive advantage. There are generally two styles of rigid manual wheelchair frames. One has a “monotube”, which is one continuous single tube, leaving the underneath of the chair open and easier to bring closer and across the body to transfer into the car. Of course with less tubing, the weight of the frame is reduced as well. When Titanium is used in a monotube style it can create “flex” which can give a softer ride, but it can take energy from the push, and there can be a loss of energy. Others prefer this “ride” because they find dampening and softer ride more comfortable or to have a positive effect to reduce tone or pain when propelling the chair. The second style of rigid frame is a “box ” frame which is designed with an added support tube which adds rigidity under the frame and therefore less loss of energy. This will make the chair wider or deeper underneath and therefore takes up more space across the body to transfer into the vehicle but you gain significant stability for propulsion efficiency. Rigid frames typically have a “fixed front end”, which means that it does not move out of the way for standing transfers, but look for the option of a single side “flip-up” footplate that opens the front area of the chair for transfers. In some cases the legrests can then swing-away once the footplate is lifted. It is important to keep this in mind and trial this frame to be sure it will work for you. As with folding frames, “quick release axles” allow you to easily remove the wheels. You can usually order back canes that “fold-down” making the frame smaller to assist with transferring the frame into a smaller boot or vehicle. In the rigid frame, there are “fixed” and “adjustable” frames, meaning that if you have been using a chair for an extended time and know your exact frame measurements and angles, they can be ordered custom but cannot be “adjusted”. If you are uncertain of that exact body position, “adjustable” chairs. 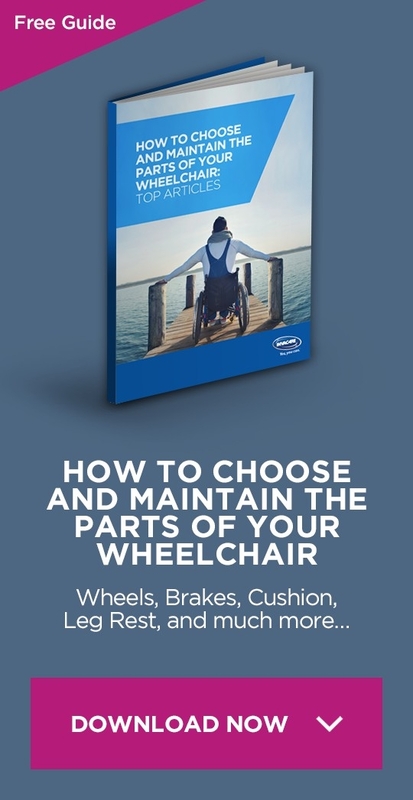 If you are able to independently propel a manual chair and whether you choose a manual or rigid frame, one of the most important configurations of the chair is the proper wheel alignment. This should be assessed by the OT/PT or other professional. In order to protect the shoulders and wrists and provide an energy efficient push-stroke the wheel should be aligned with the shoulder and fingers reach the axle. This decision is very much based on the ability to “balance” the chair with regard to tippiness and if you have the wheelchair skills to manage the chair with the wheels in a more forward alignment. Newly injured individuals may have to start with the wheels farther back until they develop the strength, trunk balance and skill to manage the chair. If you propel with one arm and foot, or both feet, you will want to be sure the “seat to floor height” is correct to help you pull through with your feet for optimal rolling. See the following link to learn more about ultralight manual wheelchairs.